Free Shipping Included! Necklace Gift for Girlfriend/Wife, Sterling Silver Cute I Love You Compass Heart Jewelry for Her, Valentines Day by Efy Tal Jewelry at The Black Pearl. MPN: SILVER COMPASS NECK LOST WITHOUT YOU. Hurry! Limited time offer. Offer valid only while supplies last. 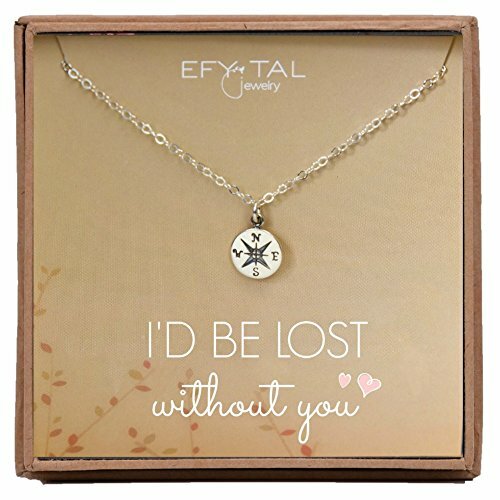 THE MEANING: Show her how much she means to you with this symbolic, meaningful and understated necklace on an 'I'd be lost without you' card. It is subtle, not over the top but has so much meaning behind it. She will be so proud to wear it. Perfect for girlfriend from boyfriend or for wife from husband for Valentines day, birthday, anniversary or any special occasion. MANUFACTURER GUARANTEE: 2 year manufacturer warranty on chain, which has a spring ring clasp. All the metals we use are lead free, nickel free and hypoallergenic. Excellent customer service, and Efy Tal Jewelry 100% guarantees your satisfaction. HANDCRAFTED IN THE USA: in the Efy Tal Jewelry studio in Glen Rock New Jersey. This unique and heartfelt necklace is beautifully gift wrapped with a special card and ready for giving. Carefully and specially packaged so that chains won't tangle. Makes a sentimental surprise for any awesome lady from child, husband, or significant other. Great gifts for Mom or Grandma on Mother's Day, anniversary, or birthday. LENGTH AND SIZE: Necklace measures 18" but is adjustable! :) This length works on practically anyone! If the length is not perfect Efy Tal Jewelry will adjust it for you for free. You can't go wrong with this length. Check out picture on model to see the size an scale of the compass. Handmade craftsmanship any woman can appreciate.